Hello everyone and Happy Newt Years Eve! 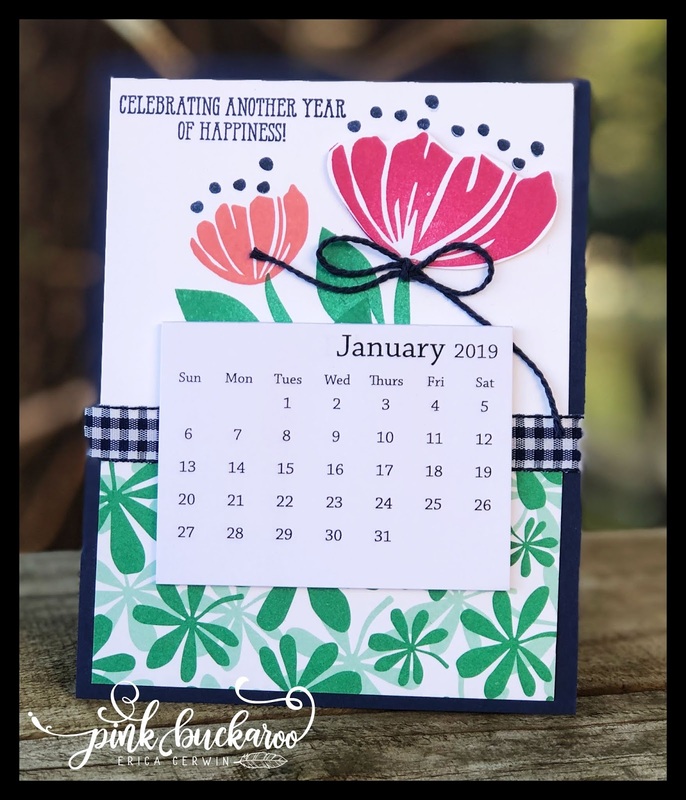 I've got another desktop calendar design to show you today! It's called Lasting Lily. It's one of the level 2 rewards, which means it's free with a $100 purchase. The colors are Blushing Bride and Old Olive. I also added some Adhesive Backed sequins. The sentiment is stamped on a label cut with the Stitched Shape Label Framelits. I'll be back tomorrow with another design- see you then! Hey everybody! It's time to share all the fun desktop calendars I made in November to send out with this year's catalogs. Anyone who placed an online Stampin' Up product order with me in the last six months received a handmade calendar in their Occasions catalog. 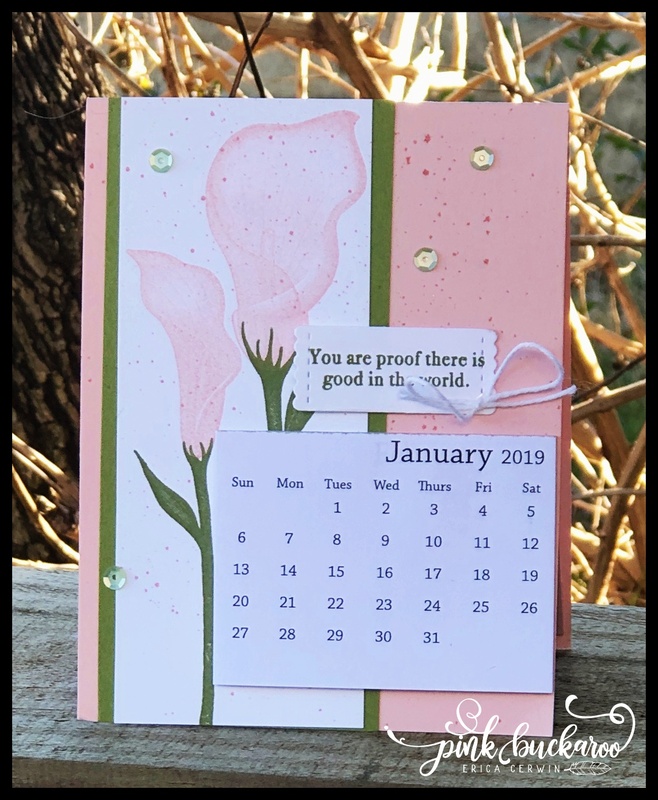 I made several versions and today I am sharing the one that features the Bloom by Bloom stamp set. 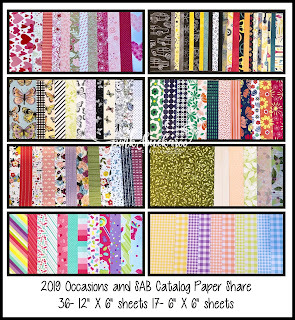 Bloom by Bloom is a fun set that will be available in the Occasions catalog that goes live on January 3rd. If you'd like a catalog, email me and I'll get one out to you next week! What is a Product Share? It's a great way to get a little bit of all the new ribbon or paper. 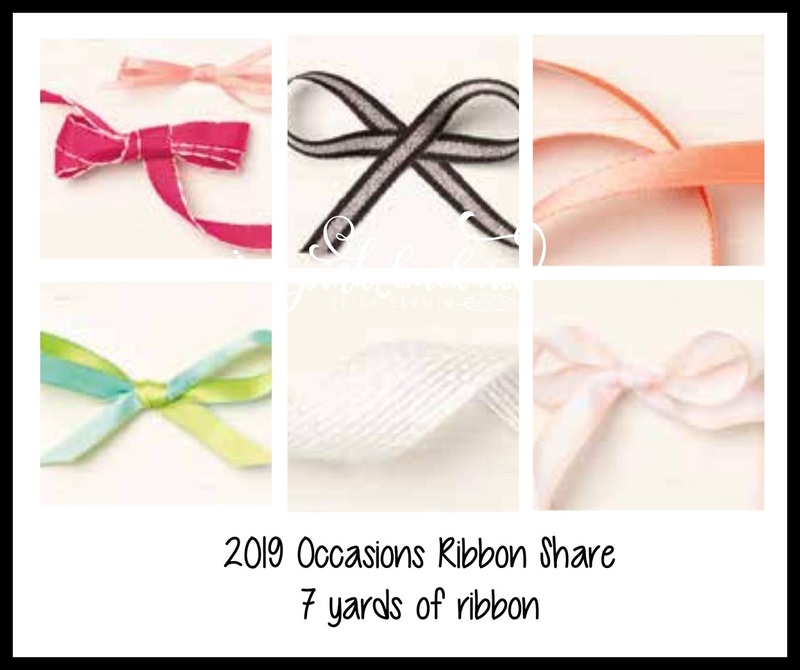 I cut the bolts of ribbon in 1 yard lengths and you get 1 yard of each color. For the paper, I cut the (12"X12") paper to 6" X 12" pieces and you get one of each pattern. Two of the DSP packs come as 6" X 6" so you will receive 1 full sheet of each pattern. It's a great way to figure out which ones you like the most and want to invest in. Registration for both shares closes on January 3rd. Add the ribbon to the paper share and you won't pay the additional shipping plus you'll earn Sweet Pins and Tags Embelishment Pack for free! Email me for Registration Link! If you purchase both the ribbon and paper share, you only pay $7 for both shipping (already included in the paper price) AND you will receive Sweet Pins and Tags Embelishment Pack for free. If you are local, I have included registration options for you that does not include any shipping. Hi everybody! I wanted to let you know that this week and next week will be quiet here at Pink Buckaroo Designs. I am taking both weeks off to spend with my family. And when I say "off" I just mean from blogging and FB Live. I am actually busy preparing for Bingo and Bingo On line as well as planning my classes for January! But, I wanted to let you know I won't be posting much over the Christmas week. But, I do have a new project to show you today! It's one of the cards from this month's Stampin' Blends Club. It features the Postcard Pals stamp set. 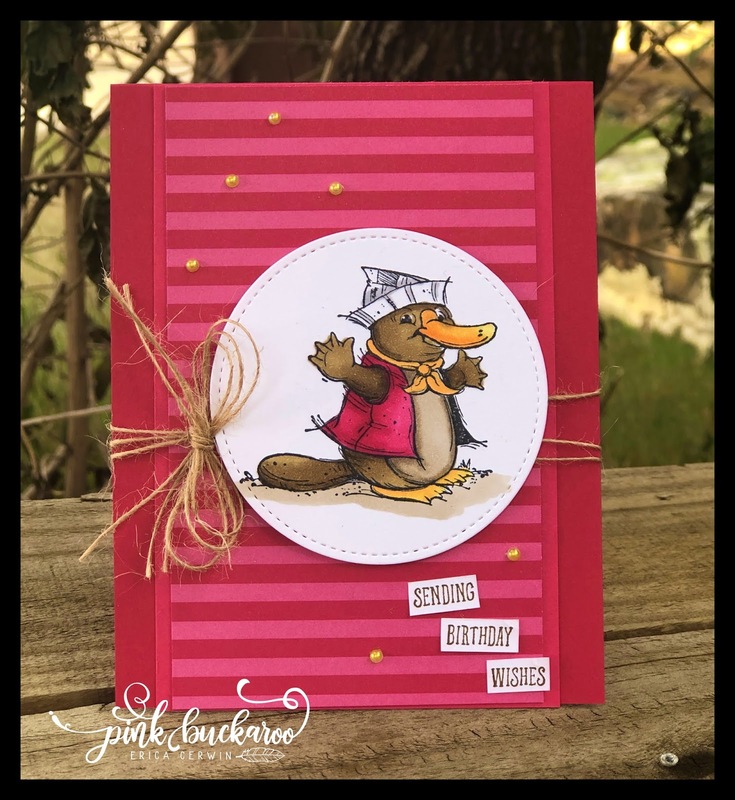 I used Real Red, Mango Melody and Soft Suede to color this little platypus. The paper is from the Regals DSP Stack and I layered a piece of Melon Mambo behind it. Don't you just love how these color pop!! Ok, thats it for me! I might pop on Facebook this week to show you the gift cards I made for the girls' teachers, but it will be a surprise if and when I do. I'll make sure to post here afterwards! San Antonio event AND Online event! 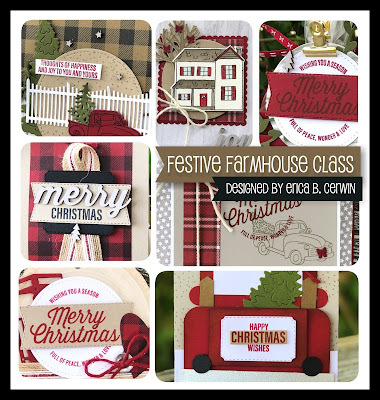 Festive Farmhouse PDF now available! Hello everybody! It's time for another Facebook Friday! And today, I am featuring the Tags & Tidings Bundle. This is a very cleverly designed bundle from Stampin' Up in that it's one big stamp and one big Framelit! Makes tag making quick and easy AND, BONUS- you won't loose any of those tiny pieces! In case you've never joined me for facebook Live, I go live every Friday at 2:00 CST on my Pink Buckaroo Stampers Group page with three projects. Everyone is welcome to join! I also go live on Tuesdays on my Pink Buckaroo Designs Page. First up is a Gingerbread Bath Bomb Gift Box. The Gingerbread Bath Bomb is from Bath and Body Works. 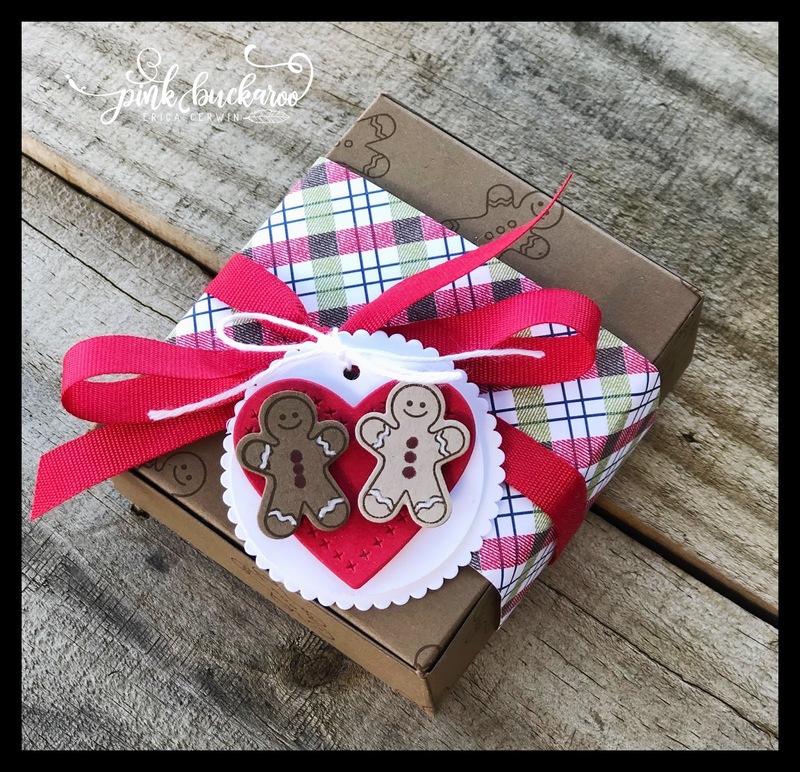 If you can't find them, you can always put gingerbread cookies in this box! Next up, is a Hot Hands Gift Pocket. We love these in the winter. Yes, we live in South Texas, but the morning walk to school is frosty most days! SO, we buy these guys in bulk! And, kids love the novelty of them! So, grab yourself a box from Walmart, Target or Amazon and make a bunch of these. And, they're not just for Christmas- they are for the whole winter!! PS- Thank you Patti, we adorable downline, who designed this holder originally!! 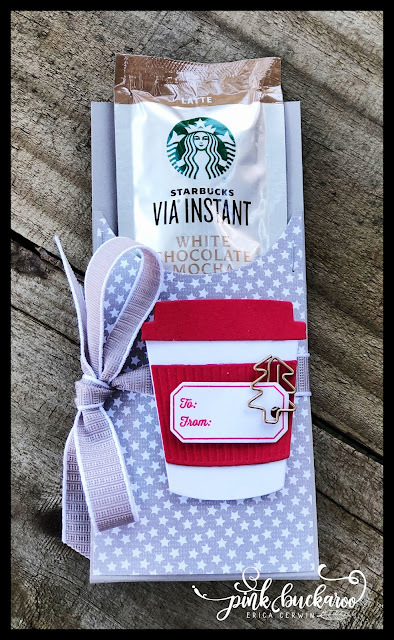 And last is a Starbucks Via Instant gift pouch. This was a special request from someone on Facebook and I couldn't wait to get it done. I kept it simple in case you want to make a load of them for your office co workers! 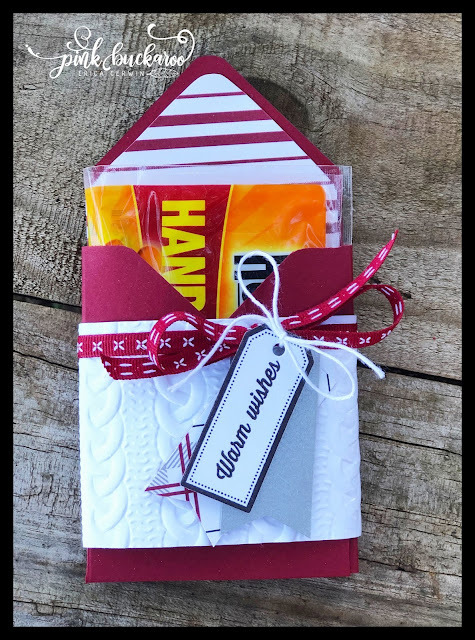 And, if you didn't catch Tuesday's Facebook Live, here is the Gift Car Holder (also designed by a downline Laurie!!!). You an see the details on this project here. Congratulations to the winners from last week:Hillary Fetzner and Ruby Nygard. And congrats to Susan Little who won the prize for sharing Wednesday's video! Thanks ladies! Make sure to email me your mailing address. You have two weeks to claim your prizes and I only ship them in the United States. This week, I'm giving away two Spirited Snowman stamp sets!! It will close on December 20th. Email me for full details and sign up link. Hey everybody! Today, I'll be live on Facebook at noon CST showing how fun the Tags and Tidings Bundle is. It really is a sleeper in this catalog and I can't wait to show it to you! It's my Products of the week and I'll be live on Friday at 2:00 CST with three more projects as well! The stamp is actually one big stamp and the framelit is one big framelit! It really helps to simplify your crafting and you can crank out those tags in no time! See it here in my online store. My project today is a gift card holder. I was SO inspired by my downline this week and had to CASE her! So, Laurie, thank you for the inspiration! We did a team Gift Card Holder exchange and they were amazing!! This one slides up to reveal the gift card inside. The little tag was the perfect addition at the top along with the Poppy Parade Woven Ribbon and Boxwood Wreath. box bottom- 4 3/4" X 5" Poppy Parade, score the long side at 2 1/2"
box top- 5 1/4" X 3", score the short side at 1 1/2"
And here is a close up of the tags I fancied up. You don't have to fancy them up, but I thought it was kind of fun to make them look a little more dressed up! If you want to place an order, please use Host Code PBS2NWG3. If your order is over $30, I'll send you Friday's make and take pack for free next week! Order deadline will be Monday at midnight. 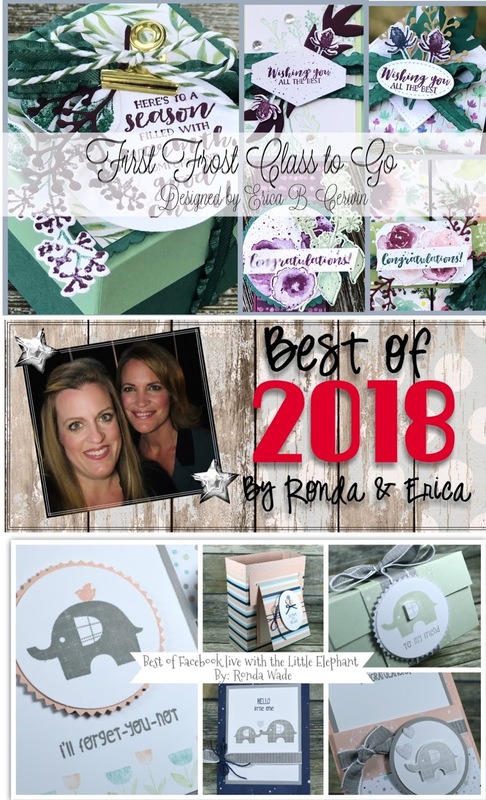 Best of 2018 with Ronda and Erica!